Young guitar player José del Tomate, was born in Almería in the heart of a family of artists. His father, Tomatito, and his great-grandfather, Miguel Fernández Cortés ‘El Tomate’, have been his main inspiration, although he also recognizes strong influences from Sabicas, Paco de Lucía and, particularly, his uncle, ‘El Niño Miguel’. Although he is just 19, he has already performed in very renowned festivals in the current flamenco environment and he has backed his father in long International tours. This summer he will present his first album ‘Plaza Vieja’. José Fernández Torres “Tomatito”, is one of the alive great names of the flamenco guitar. Born in Almeria, his extraordinary skills captivated even Camarón de la Isla, with whom he toured with his guitar for 18 years. After Camaron’s death, Tomatito started a solo career, dazzling with his delightful sensitivity and a performer talent out of the ordinary. He has toured the World with his gifted performance, from New York to Moscow and from the Middle East to Hong Kong. With a very charismatic personality, and a strong commitment to the development and dissemination of the flamenco art, he has worked with many great myths such as Elton John or Frank Sinatra, and has influenced a whole generation of younger guitar players. 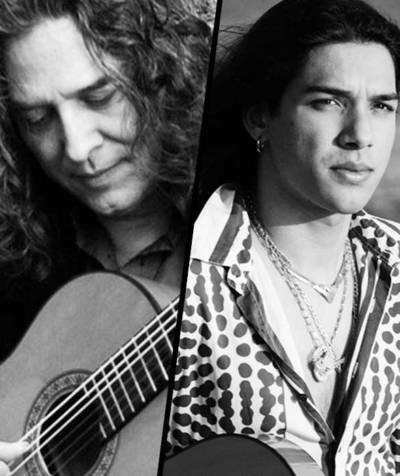 Father and son present this two guitars performance which is expected to be one of the most remarkable recitals of the cycle ‘Flamenco en los balcones’ of this edition of Flamenco On Fire. This performance brings together en el que se unen dos generaciones de guitarristas de una de las dinastías imprescindibles del flamenco.